What are truffles? Oftentimes, truffles are referring to a certain type of gourmet mushrooms, but not around here! I love mushrooms, and they certainly have their place in my life, but let's face it - chocolate is nicer. Here's one cute story of the history of the truffle (the chocolate kind) that dates back to the 1920's when a legendary kitchen master named Auguste Escoffier discovered this culinary sweet delight. It is said that the first chocolate truffles were discovered "by accident" when Chef Escoffier’s apprentice poured in a hot cream over the chunks of chocolate instead of the sugared egg. Since it was a mistake, he opted to set it aside and let it cool. Upon checking, the mixture was hardened into a paste which the apprentice decided to form into spheres, and roll in sweetened powder. These little morsels looked much like a truffle mushroom and so they called them chocolate truffles. Well, that's one story, and I like it! But, the truth is I've found a number of different claims related to the history of the truffle, including the claim that chocolate truffles were first made by M. Dufour in Chambéry, France in December 1895. Personally, I don't really care when or where chocolate truffles first made their debut. I'm just really glad they did! Over the years, there have been so many different truffle variations attempted and some of them have become very popular. 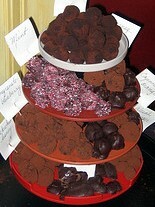 There are chocolate truffles recipes that include, chili, champagne, fruit, or spices, to give you a few clever ideas. You can substitute dark chocolate with white or milk chocolate, and even coffee. To add some kick in every bite, add mint or peppermint. You can even make it fruity by pouring in orange juice or raspberry. Over the years, the popularity of the chocolate truffle eventually spread all over the world and was heavily modified. In the United States, truffles were first made by a chocolatier named Joseph Schmidt in San Francisco. His were described as a truffle in a half-egg shape with dark or milk chocolate mixture. The Canadians want their truffle with graham cracker crumbs and peanut butter. European truffles, on the other hand, are described as an oil-in-water mixture. The Swiss combine melted chocolate and a cream-butter mixture and bring this to a boil to create their very own version of truffles. These modifications to truffles resulted to different truffle tastes, but it's amazing how people are still into it! We've got a heap of chocolate truffle recipes here if you'd like to try your hand at making some. Chocolate truffles recipes vary, with some more complicated than the others. Basically, a truffle is done by making a mixture for the center known as ganache. Ganache is a mixture of heavy cream and chocolate, either bittersweet or semisweet. These ganache balls are dipped in melted sweet chocolate or coated with cocoa powder or some other interesting ingredient. With just 30 minutes of your time, you can satisfy your own sweet cravings or pamper someone you love by making chocolate truffles. What are truffles? The next time that you encounter this question just simply say, it's a ball of ganache with a hard chocolate shell that once you taste, there’s no way that you would not want another bite.